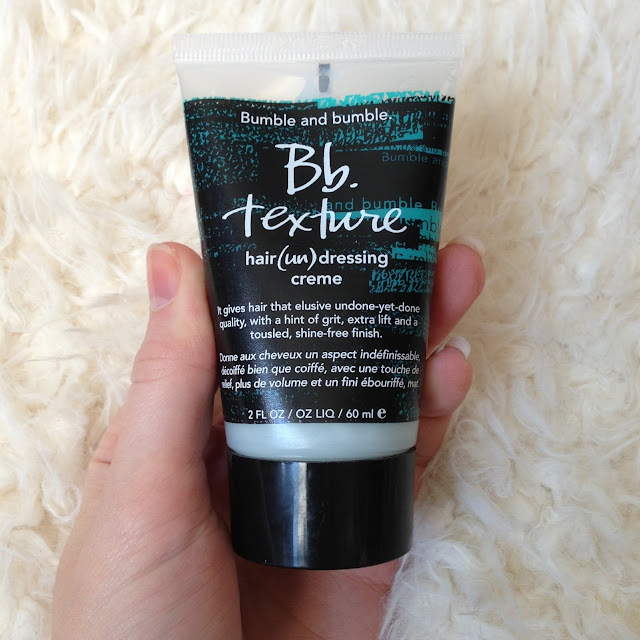 I decided to pick up the small bottle of the Bumble and Bumble Texture, hair (un) dressing creme after hearing rave reviews about it. You add just over a pea size amount into your wet hair, scrunching it into the roots from underneath. When you go to dry your hair, the texture is then a bit more workable, almost making the roots a bit dryer and thicker meaning that it volumises the hair a lot more. The product is on the pricey side as it is a professional hair brand, designed and tested by hair dressers. For this though, you do feel special using the product and really trust it will work. The smell is absolutely amazing also, almost like perfume, its gorgeous! I also really like the packaging of the product, and it comes with a twist lid so you can quickly squeeze the product into your hand and twist it to close for ease. I used it last night for the first time and did notice a difference in the volume and feel of my hair. It definitely volumises the roots and creates some lift. I think I may need to keep experimenting with it, perhaps adding a bit more, or perhaps a bit less each time, but overall I am really impressed with it. After this bottle is gone, I think I will probably treat myself to the larger £21 bottle.